Contact Rhode Island Fishing Charter, The Adventure. 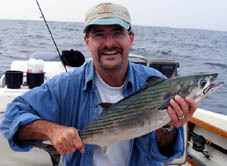 Book your RI fishing charter early to ensure you get the captain, boat, and date you prefer. 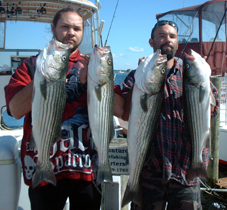 The summer months are a very busy time so contact us to book your Rhode Island charter fishing boat, otherwise you may not get the date you want. 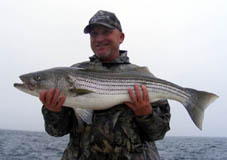 For Rhode Island May and June are not as busy as other months and it isn't necessary to book your fishing charter too far in advance. July and August are killer months and you want to try to book a fishing charter 2 weeks in advance. September is pretty busy and you need to book early if you want weekend dates, but weekdays usually don't need to be set too far in advance. Early October is busy and as of the 22nd the Tautog fishing heats up and weekends become very scarce, but weekdays aren't difficult to book. Contact us with any questions you may have about the best type of fish to target based on your charter date. Feel free to contact us with any questions you may have about how a charter works, about the boats themselves, or anything else we may be able to answer to put you at ease about your upcoming fishing trip. If you want to just come down and visit Jim's Dock and the boats, just let us know. The marina is a really nice place and we love having our boats there. Bass taken with Topwater Plugs. Bass taken on Soft plastic. The Doc with a nice Bonito.